April 26, 2017 2 comments on "Italian Dressing Mix"
It is fun to make homemade salad dressings, especially homemade Italian dressing mix. Homemade dressings taste so much better than the store bought kind. A couple of years ago I started by making homemade ranch dressing mix. I’m not kidding, after you have had homemade ranch salad dressing, you will not want to buy it from the store again. My boys won’t eat Hidden Valley Ranch anymore. Italian dressing is also very easy to make at home. All you need to do is make the mix and then add oil and vinegar when you are ready to make up a batch. Mix all ingredients together. It will fit in a half-pint or pint-sized canning jar. To make Italian salad dressing with this mix, mix together 2 tbsp. of the mix with 1/4 c. white vinegar, 2 tbsp. water, and 1/2 c. olive oil or other salad oil. Shake well before using. 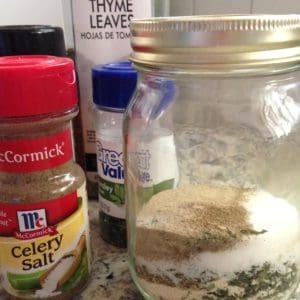 Note: Three tablespoons of this mix is equivalent to one store-bought packet of Italian seasoning mix. 2 Comments on "Italian Dressing Mix"
Yes, it is very easy! Glad you liked it!